On a Thanksgiving weekend Saturday, I take my first-ever solo paddle trip. 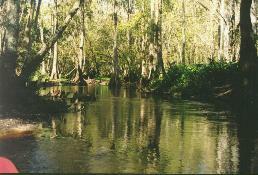 The river I choose is the Peace River, which is on the State of Florida Recreational Trails System. 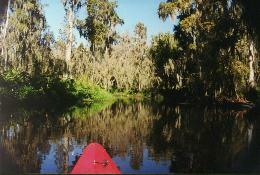 The river is 105 miles long, and flows southerly from its origin in the Green Swamp to its destination in the Gulf of Mexico. I put in my kayak at an upstream location. Here, I find the river to be pleasantly narrow, with shallow water. During my 4-hour paddle downstream and back, I see no development whatsoever. It is peaceful and quiet, and seemingly far away from civilization. 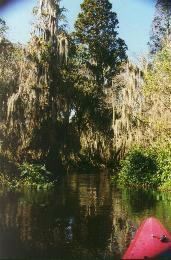 The upstream portion passes through a cypress forest. The tall, Spanish moss-draped cypress trees and cypress knees makes the river quite like Prairie Creek in Gainesville as to its appearance. Much of the river banks are covered with grasses and elephant ear plants. Wildlife is quite abundant. I see no boats along the entire paddle, and enjoy seeing hundreds of wading birds, small alligators (although the last one I see just before he slides into the water is rather large), otters, and turtles. The river is surprisingly enjoyable, given its proximity to Orlando and Tampa. I will return again to enjoy its solitude and beauty.